Are you looking for underfloor heating in Guernsey or Jersey? Pulse Mechanical Electrical are a leading underfloor heating installer covering Jersey and Guernsey. As well as underfloor heating, they cover all aspects of heating and gas services for both domestic and commercial buildings. 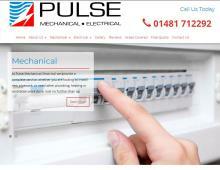 Pulse Mechanical Electrical are Loxone Silver Partners, supplying smart home systems in Guernsey & Jersey. From design, supply, installation and maintenance they can install everything from automated one room solutions and intruder alarms to advanced solutions for your whole home. Customers receive bespoke smart home installation services in Jersey & Guernsey to give them complete control over their property'sTV’s, audio systems, lighting and much more. Pulse Mechanical Electrical also offer TV satellite installation in Guernsey & Jersey. Pulse Mechanical Electrical provide ventilation systems in Guernsey & Jersey for industrial and commercial use. Whether you want to remove stale air or provide a fresh air system, they can provide a range of ventilation systems to help you. They also offer heat recovery ventilation in Jersey & Guernsey to help the efficiency of your air conditioning system, installed by an experienced air conditioning engineer in Guernsey. For more information on the range of mechanical and electrical services provided by Pulse Mechanical Electrical, call them today for a no obligation quote.